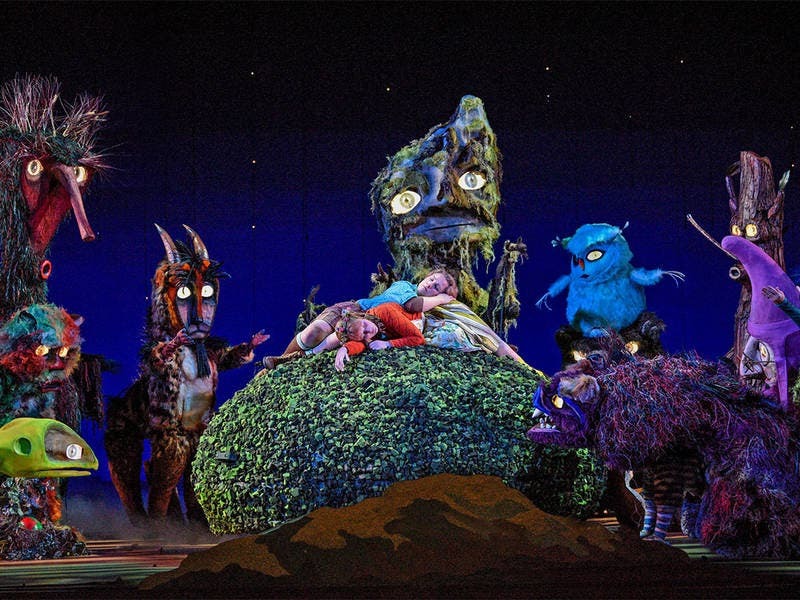 LA Opera’s Hansel and Gretel, is Fantastical! Directed and designed by Doug Fitch who has a magic touch that is sure to delight audiences of all ages. Conducted by James Conlon and played with excellence by LA Opera Orchestra. A Gingerbread house made of sweets, a wicked witch disguised as a baker, comical elves and the illuminating voices of Los Angeles Children’s Chorus makes Hansel and Gretel a wonderful celebratory start to the holiday season. Bring your kids and have them leave their cells behind. Engelbert Humperdink was a prolific composer, but it was this production that made him his name and fortune. Humperdinck was a big fan and had a close relationship with Richard Wagner. One can hear the influence of Wagner in the score of Hansel and Gretel. The story by the Brothers Grimm takes us back to a time when life was tough and children engaged in chores more than play. Food was scare and living in the forest was spooky, especially if you get lost as these two siblings do. Most of us know the tale from childhood yet it never ceases to delight. Hansel and Gretel first premiered in 1893 in Germany. The composer’s sister, Adelheid Weete, also the librettist, asked her brother to write the music to a short story she wrote for a play her children were to perform as a surprise for her husband’s birthday. And the rest was operatic history. The characters of The Sandman and the Dew Fairy were created for the original story. Mezzo-soprano Susan Graham dominates the stage. She is campy funny and her performance as The Witch is a tour-de-force. Gretel, played by Soprano Liv Redpath is adept. An interesting choice to cast a female to play Hansel in Sasha Cooke, Mezzo-soprano. This performance by LA Opera was given on Opening Night – Saturday, November 17, 2018 at The Dorothy Chandler Pavilion. There will be six performances on the following dates and times: Saturday, November 17, 2018 at 7:30pm, Sunday, November 25, 2018 at 2pm, Thursday, December 6, 2018, at 7:30pm, Sunday, December 9, 2018, at 2pm, Wednesday, December 12, 2018, at 7:30pm, and Saturday, December 15, 2018, at 7:30pm. Tickets are on sale now. Tickets begin at $16 and can be purchased online at LAOpera.org, by phone at 213.972.8001, or in person at the LA Opera box office at the Dorothy Chandler Pavilion (135 N. Grand Avenue, Los Angeles CA 90012). For disability access, call 213.972.0777 or email LAOpera@LAOpera.org.